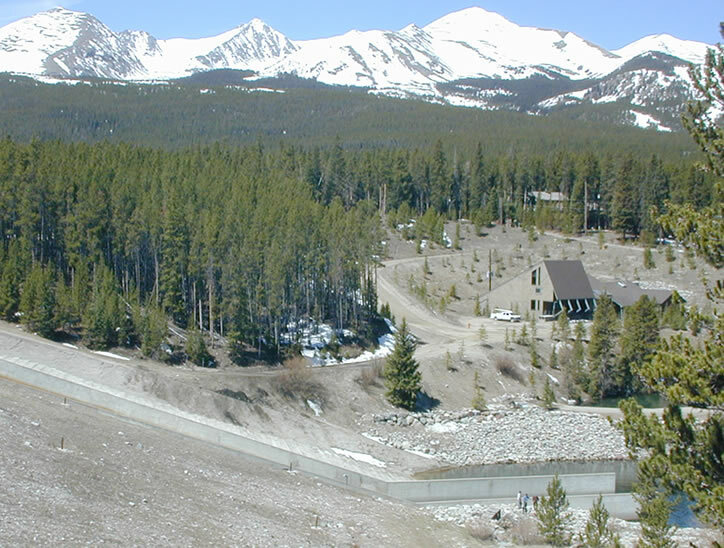 Goose Pasture Dam, located near Breckenridge Colorado has a spillway crest elevation of 9886 feet. 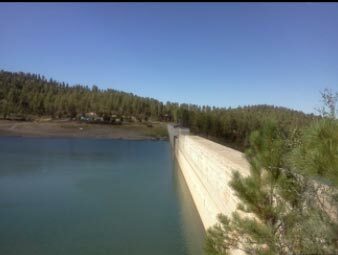 The dam is an earthen embankment 50 feet tall, 550 feet long with a concrete spillway and RCC emergency spillway built adjacent to the main chute. The dam was originally constructed in 1964. The main spillway chute is 152 feet long and averages approximately 40 feet wide. The concrete spillway slab is 1 foot thick and is used as a buttress to assist in support of the dam. During an investigation, soft soil due to lake water penetration was found under the main spillway. Two potential dam failure mechanisms were possible under the current condition. 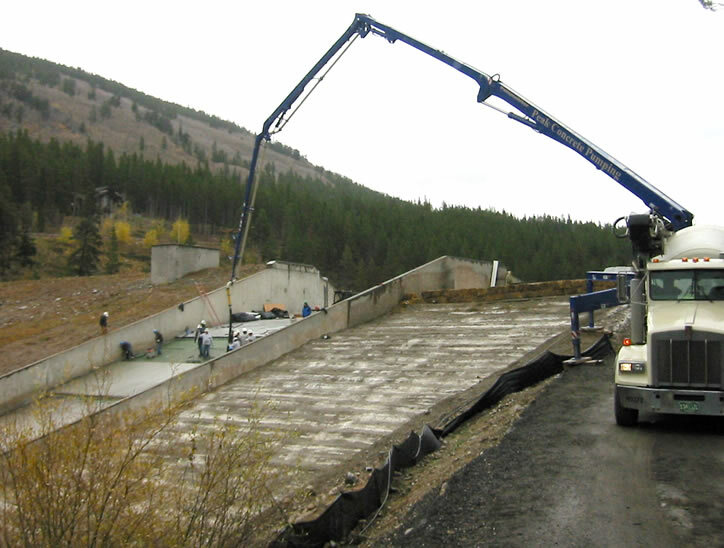 First, water under the spillway slab could create uplift pressure failing the spillway and dam. Second, the very pliable and wet soil could lose enough friction to allow the spillway to slide down the 3:1 embankment causing failure. 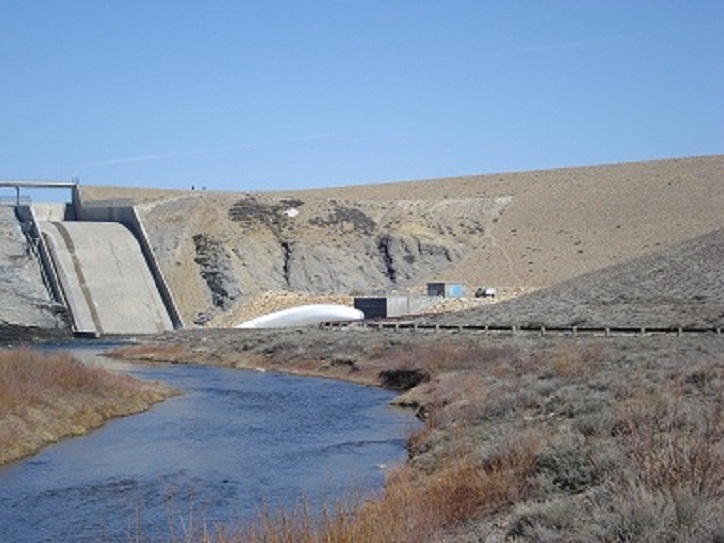 State Engineers assessed the data and required spillway remediation. The original remediation plan consisted of 55 cubic yards void grouting under the spillway, installing 43 grouted soil anchors to hold the spillway slab down followed by an average 9-inch thick bonded, reinforced concrete overlay starting at the apron slab of the spillway crest and ending at station 152.5 feet down the spillway length. Other minor work included toe drain extension, new staff gauges, spall repair and minor crack repair. A design change, effected by State Engineers, made prior to construction notice to proceed included the addition of new underdrain at two joint locations. Minor changes to the contract during construction included void grouting, anchor installation and concrete repair at the apron slab. 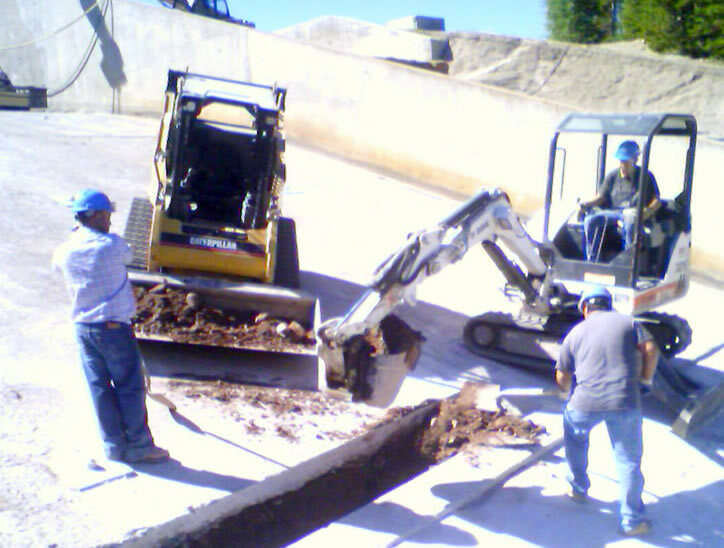 Use of excavation and drilling equipment on the concrete spillway. Placement of concrete during winter conditions. 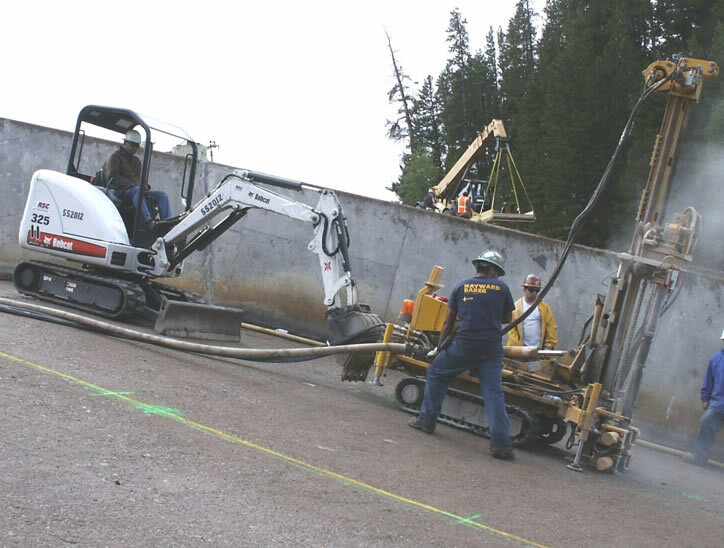 The release of air pressure for rotary drilling of soil anchors cause spillway slab to crack. Resolution consisted of drilling small diameter holes adjacent to anchor drilling location to relieve air pressure. High Phreatic water levels washed out two of the bonded sections of soil anchors. Problem resolved by re-drilling and re-setting two anchors.